More than four million U.S. taxpayers are directly engaged in the sharing economy, making everyday tasks like ordering household items, getting a ride to the airport and renting a vacation home easier for the rest of Americans. While being a member of this new era workforce is beneficial in a lot of ways – from part-time flexibility to starting a small business to supplemental income – a common challenge these entrepreneurs share is our tax code has not been substantially reformed for more than three decades. The evolution of the modern workforce is not merely a recent anomaly. Workers are shifting in mass towards flexible work arrangements as a proactive move aimed at gaining greater financial security and for the opportunity to take more control over their professional lives. Looking beyond the on-demand and sharing economy, the 1099 economy at large (which includes independent contractors, consultants and freelancers) covers an estimated 30 million workers or about 20 percent of the labor force. 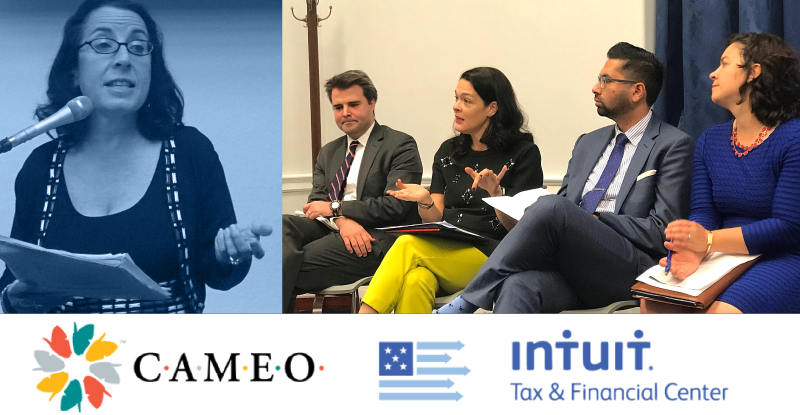 Evolving the tax code to keep up with an evolving workforce was the subject of a panel at the U.S. Capitol hosted in late October by the California Association for Microenterprise Opportunity (CAMEO) and sponsored by the Intuit Tax and Financial Center. The event brought together a leading panel of tax policy experts who urged Congress to make sure that any conversations about tax reform include simplifying the tax code for those involved in the on-demand economy. The discussion featured Heidi Pickman, Communications and Policy Director, CAMEO; Melissa Netram, Director of Corporate Affairs, Intuit; Mohammad Ali, Director of Policy and Government Affairs, Small Business Majority; Caroline Bruckner, Managing Director, Kogod Tax Policy Center and Robert Yavor, House Small Business Committee. Each expert focused on the urgency of this matter and the need for legislators to account for this new segment of the workforce when considering tax reform. The event discussed how those participating in the on-demand economy face challenges that are unique to their situation and how the current system treats this new-age workforce as if they are conventional small businesses. And that is a significant challenge. As CAMEO’s Heidi Pickman demonstrated, these entrepreneurs struggle with income volatility, they mix personal and business expenses and have limited financial resources to rely on during an emergency. But access to the on-demand and sharing economy is critical to helping these entrepreneurs achieve greater financial security. A report released by Intuit, “Dispatches from the New Economy,” shows that as many as 39 percent of on-demand workers say that the work has left them in a better financial position. So what can Members of Congress do to help this new era workforce? Caroline Bruckner suggested that the current tax system leaves many of these taxpayers shortchanged during tax time. Some even fail to file their taxes altogether leaving them to face potential audit and penalty exposure as a result of relatively low amounts of earned income and inconsistent reporting rule adoption. According to her research, over 34 percent of these entrepreneurs are unaware they are obligated to pay taxes. This is a lose-lose situation for both the Government and taxpayers. While legislation that is currently being considered in the House and Senate is the right step to clarify and simplify the existing tax code, all the panelists agreed that a larger reform is necessary to serve the needs of America’s modernized workforce. “The House Small Business Committee’s introduction of H.R. 3717, the Small Business Owners’ Tax Simplification Act, is on the right track to simplifying taxes for entrepreneurs and startups,” said Heidi Pickman. During Mohammad Ali’s presentation, he pointed out that a survey released by the Small Business Majority found that small businesses believe they are disadvantaged under our current tax system, and they want to see tax reform that creates a level playing field. In fact, leveling the playing field was more important than tax cuts because the growing disconnect in the tax code will only increase — creating unnecessary and ongoing burdens for the small business operators who power the on-demand economy. As millions of people embrace on-demand work as a way to improve financial security and stability, our outdated tax code fails these entrepreneurs. Last week’s panel made it clear that now, more than ever, policymakers must step up to modernize our tax code.